"But then there’s this: There will be no WPA-type programs in our near future. There was no appetite for them in the Obama admin in the midst of the worst recession since the Great Depression and there’s a lot less now. The reasons for that are interesting and I’ll speak to them another day". I would love to know what those 'interesting' reasons were during the midst of the crisis. Perhaps afraid of being labeled socialists? We all know how that worked out. This month another Roman coin "hoard" has been unearthed in what was Britannia. This one of over 1,200 coins, again found in a ceramic jar, buried in the ground. It is evident that 2,000 years ago in the Roman Empire, instead of electronic bank accounts like we have today, they used jars of coins as their "accounts". A short story about the find here at an antiquities blog. 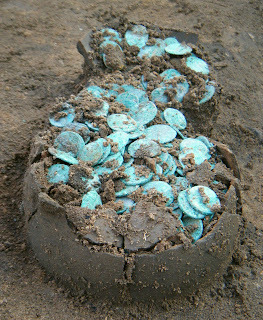 Below is a picture of the broken jar containing the coins in situ. Here is another story from thehistoryblog.com (which is a pretty interesting blog btw). The antoninianus started life off as a silver coin issued in the early 3rd century but, by the time of the Hyderabad hoard, it had become very debased and ended up as a copper-alloy coin with a very thin silver coating. This is very interesting how brainwashed what should be objective archeologists have become due to the propaganda put out by those who peddle the "hard money" theories and those who advocate the view that "money is a commodity". The historians actually use the word "debased", to describe these 2,000 year old coins used by the most powerful empire the world had ever seen to that point. Severe inflation reduced its monetary value which is why later antoniniani are common finds on archaeological sites of the third quarter of the 3rd century. The Hyderabad hoard belongs to this period. Again more quantity theory of money dogma, the authors here are actually trying to pass off commentary on the inflationary environment in Brittania 2,000 years ago; were they there? How about sticking to the empirical facts folks and leave the dogma out of it. As centuries had gone by since the Romans first arrived in Britannia; a poll tax for provision purchases of the expanded legions, the use of these coins in commercial transactions and the local savings desires of the Roman currency had become more widespread, so of course we would find evidence of larger amounts of Roman coins in Britannia. I can here the Austrians already: "Debasin'!"... "They were printin' money!".... "Those Roamins' was inflatin' the currency!"... "this led to the downfall of the Roamin' empire!". This was a turbulent time for the Roman Empire known as the Crisis of the Third Century. Twenty-five emperors reigned between 235 and 284 (Ed: Hel-lo! ), and in 260, under pressure from barbarian invasions (Ed: do-what?! ), the empire split into three (Ed: okay!) warring sections. The province of Britannia joined Gaul, Hispania and Germania to form the Gallic Empire under the control of the Batavian usurper Postumus. Postumus was himself usurped and was killed by his own troops (Ed: The Roman Doug Neidermeyer?) in 268. The Gallic Empire fell apart and a chain of would-be emperors followed for a few years until the Emperor Aurelian reclaimed the provinces after his victory in the Battle of Châlons in 274. Please ignore this utter political chaos folks, it was "money debasing" that was the real problem for Rome in the third century.... LOL! Yves comments on Stephanie Kelton's recent post in Stephanie Kelton: What Happens When the Government Tightens its Belt? Yves brings in Bill Mitchell to clarify and adds her own comments. Good read and nice plug for MMT. I'm sure the comment section will be interesting, too. Econintersect—"Greece May Suffer Temporary Loses of Sovereignty"
How much will a financial bailout cost Greece? How about its independence as a nation? TheFinancial Times reports (article by Peter Spiegel, Quentin Peel and Ralph Atkins) that European leaders are negotiating a deal that would lead to unprecedented outside intervention in the Greek economy, including international involvement in tax collection and privatisation of state assets, in exchange for new bail-out loans for Athens. This solution is that austerity could be imposed from outside by the EU. Greece would, temporarily, not have its own government. UPDATE: Mish reports that a run on Greek banks is taking off. That's national sovereignty, not monetary sovereignty. The voluntary surrender of monetary sovereignty to join the EMU is lead to loss of national sovereignty as a result. The U.S. Central Intelligence Agency warned in a report that the tough austerity measures and the dire situation could escalate and even lead to a military coup, according to a report by Germany’s popular daily Bild. According to he CIA report, ongoing street protests in crisis-hit Greece could turn into escalated violence and a rebellion and the Greek government could lose control, said Bild. The newspaper said the CIA report talks of a possible military coup if the situation becomes more serious and uncontrolled. Michael Hudson — "EU: Politics Financialized, Economies Privatized"
"Language is adopting itself to reflect the economic and political transformation (surrender?) now underway. Central bank 'independence'was euphemized as the 'hallmark of democracy,' not the victory of financial oligarchy. The task of rhetoric is to divert attention from the fact that the financial sector aims not to 'free' markets, but to place control in the hands of financial managers – whose logic is to subject economies to austerity and even depression, sell off public land and enterprises, suffer emigration and reduce living standards in the face of a sharply increasing concentration of wealth at the top of the economic pyramid. The idea is to slash government employment, lowering public-sector salaries to lead private sector wages downward, while cutting back social services. "The internal contradiction (as Marxists would say) is that the existing mass of interest-bearing debt must grow, as it receives interest – which is re-invested to earn yet more interest. This is the 'magic' or 'miracle' of compound interest. The problem is that paying interest diverts revenue away from the circular flow between production and consumption. Say’s Law says that payments by producers (to employees and to producers of capital goods) must be spent, in the aggregate, on buying the products that labor and tangible capital produces. Otherwise there is a market glut and business shrinks – with the financial sector’s network of debt claims bearing the brunt." What is the problem? Rent-seeking, defining economic rent as land rent, monopoly rent, and financial rent. From a Minskyian viewpoint of financial instability arising from private debt, this political/economic model is unstable and is not going to end well. Iceland has already said, "No deal," and we are already seeing social unrest rising in MENA, the EU periphery, the UK, and parts of the US. When banks failed, the government paid up. But the bankers responsible kept their bonuses from the years of excess. This column argues for 'crisis contracts'…. "Definition of a crisis: A crisis occurs when the average equity capital in the banking system (relative to the assets) falls below a critical predefined threshold. When a crisis occurs, the top managers of major or highly interconnected banks contribute a portion of their earnings from the previous years to a rescue fund for the recapitalisation of the banking system." This is similar to re-instituting the partnership model that dominated banking and finance until recently. That was a good model since it placed responsibility on the shoulders of those ultimately responsible for extending credit and aligned incentives with reality. Greece seems to be getting a lot of the attention lately, but things have been "heating up" on the other end of the Mediterranean too this week as we head into summer in the northern hemisphere. Below is some violent video of recent unrest in Spain, where we see countrymen pitted against countrymen in violent clashes. It looks mostly like employees of the state brutally trying to evict what looks like young peaceful protesters who just want to be employed. Young persons who want access to a means of subsistence for themselves and probably a naturally desired family or household. It has been reported that 1 in 5 of Spanish citizens under 30 years old have yet to find their first job. How much parasitism can the Grecian host take? --"“Saving the euro” is a euphemism for governments saving the financial class – and with it a debt dynamic that is nearing its end regardless of what they do. The aim is for euro-debts to Germany, the Netherlands, France and financial institutions (now joined by vulture funds) are to preserve their value. (No haircuts for them). The price is to be paid by labor and industry". A great MMT article from author Ellen Brown on the debt ceiling fiasco. There is, however, a solution to this problem, and it was discovered by Japan. The government can spend, not by issuing bonds at interest to the public, but simply by creating an overdraft at the central bank, as Ruml recommended. The Bank of Japan now holds an amount of public debt equal to the country's GDP! I've created a chart at FRED that compares household net worth to household financial obligations over the last 15 years or so. This is a play off of Keen's charts that Tom posted yesterday. Similar to what Keen does this compares net worth, a stock, ie measured at a moment in time, to financial obligations ratio, a derivative of a flow, measured per unit time. Obligations here are represented as a percentage of income flow. To say the least, net worth really took a hit at the GFC, in fact this hit dwarfs even the dot-com crash of 2000 era. All the while net worth was increasing in the last decade, so was the obligation ratio. While increasing obligations is evidence of the success of the rent seekers, apparently the household sector was indirectly participating in this success probably due to increases in residential property values and household stock portfolios exposed to rent seeking. At this point, obligations as a percent of income is at a 15 year low. So somehow, the household sector has been able to shed obligations as a percent of incomes. This being perhaps more significant because incomes are down. Could also be evidence of cohabitation of would-be households. The drop in obligations shows no sign of bottoming, while net worth has stabilized. Evidence of wealth moving to the top, while J6P is still de-leveraging. A bottom in the Obligations Ratio may be something to look for as evidence of the "recovery" finally starting to broaden. Steve Keen: Will the US double dip? Short answer, yes. It's the debt, stupid. Those coming to MMT/Post Keynesian economics from the non- or at least less-academic world may not be aware of some of the methodological differences that exist between our approach and that of mainstream economics. These philosophical issues, though not nearly as exciting as talking about Federal Reserve policy or the organization of the financial market, truly lie at the heart of our disputes. One should, therefore, have at least have a passing familiarity with these in order to understand the rhetoric of the arguments (and how to win!). Method involves how a particular school of thought views the nature of knowledge and the legitimate means of creating it. Say you are a biologist and want to understand more about the behavior of the field mouse. How should you do so? Do you imagine yourself as a mouse and decide what you would do in your daily life? Do you catch a field mouse and put it in your office, then write down what you observe? Do you set up cameras and try to capture images of the field mouse in its natural setting? Which of these would be most effective? These are the sort of questions that those who study method try to answer. Premise 1: All Texans own a cowboy hat. Premise 2: Alex is a Texan. Conclusion: Alex owns a cowboy hat. This argument is valid if the conclusion is supported by the premises. Sure enough, that looks okay. Note that determining validity is a relatively (though not completely) objective process. Mathematics provides one means of determining validity, which is one of the reasons it’s so popular in economics. And while we can most certainly enter into some serious debates with Orthodox economists over validity, I think the next concept is more important because it’s more below the surface. Whence come the premises? What is appropriate/acceptable in specifying them? This is a key methodological question. In mainstream economics, they have adopted the Cartesian tradition that argues that it makes more sense to base premises on reason than observation since the latter can be unreliable and biased by our preconceptions. If theory determines what you see, then using the latter to confirm the former is only a psuedoscientific exercise. True science involves basing the premises of your model on careful introspection and reflection. This is why Neoclassical microeconomics is based on concepts like, “all firms are short-term profit maximizers.” Did some economist do a study or survey to determine this? No. Instead, it just seems reasonable. More than that, they regard it as obviously true. How could any reasonable person disagree with this? The fact that studies show that firms are more concerned with sales and market share does not concern them. What people say and what they do are not the same. Besides, even if firms don’t try to short-term profit maximize, say Mainstream economists, they act as if they do. This is a critical methodological point. They believe that knowledge gained from introspection and the generation of “obviously true” premises is superior to that based on observation of the real world. Post Keynesian economists come down on the opposite side of that issue. To them, premises that cannot be justified on the basis of something we can observe in the real world are questionable, at best. Of course, simplification is necessary for modeling, but the guide to what the non-simplified version of the premise would be is provided by observation. In addition, we believe it vital to be able to point to a real-world line of causation to justify our claims. Neoclassicals do not necessarily agree, thinking instead that analogies and thought experiments suffice–indeed, they see them as superior because they are supposedly uncontaminated. And so this points to a deep divide between Post Keynesians/MMTers and orthodoxy. And it can be an especially frustrating one because it lies beneath the surface and leads to one side completely dismissing what the other views as “evidence.” For example, I ended up in a mini debate with a Monetarist on my Forbes.com blog. He was arguing that inflation is caused by an excess of money supply over money demand. I asked–on four separate occasions and in a very pointed manner–how can this be possible? How can the Fed raise money supply without the cooperation of the public? Can they make someone sell a government security or take out a loan? What mechanism does the Fed have at its disposal that allows it to force the money supply above money demand? I never received a direct answer. Instead, I got analogies: monetary policy is like an orchard or a fire place (Friedman’s classic mechanism being a helicopter). The Monetarist has now completely withdrawn from the conversation without ever clarifying this issue and yet at the same time stating, “If you cannot increase the money supply above money demand, you would never have inflation!” Hence, he believes this to be a critical point, but one he cannot justify in terms of real world events. He doesn’t think he needs to. Quite right. I think economics should be relevant, and he doesn’t. GDP in the first quarter of this year was reduced by more than a full percent due to a slowdown in government spending. And even with this evidence the Republicans and Obama want to reduce spending even more. That's their fantasy world of "cut and grow." More spending cuts are coming! 3. Credit dwarfs currency and changes in credit and the value of credit are far more important than the changes we have seen in money supply. 5. Misconceptions about excess reserves (Please see Fictional Reserve Lending for a discussion). 8. Failure to understand peak oil will not cause hyperinflation. Heck, peak oil will not even cause inflation. 9. Inflation in China, does not constitute inflation in the US. Read the whole thing at Hyperinflation Nonsense in Multiple Places. Oppenheimer's Fadel Gheit weighing in with some excellent comments on the current state of the oil markets. Richard Koo: "The IMF and the OECD are people who know nothing about anything." Condolences to the family, friends and associates of Mark Haines. The sudden passing of CNBC on-air anchor Mark Haines has left the financial news industry without one of the most skeptical and challenging interviewers in the business. Mark seemed to always have a healthy dose of skepticism and never seemed to be a pushover when fed corporate management propaganda and spin. I often enjoyed his challenging interviews and I'll miss his reporting in the mornings at CNBC. Vice-President Biden is patting himself on the back for this? ---Vice President Biden and congressional leaders left a meeting on the debt limit saying they were on track to find $1 trillion in deficit cuts. Most of the media, dozens of Wall Street analysts, pundits of all sorts and ALL Republicans everywhere were telling us back in November that if the GOP took control of Congress or the House in large enough numbers, then private investment would boom and the economy would take off because of their "business friendly" policies. I guess it's just an incovenient fact for most Republicans, but since the their party's landslide in last year's midterm elections, net private invesment has gone nowhere but down. In fact, the only upturn in net private investment that we have seen in the past five years occured from 2009 through the third quarter of 2010, thanks to the Obama stimulus package. That stimulus resulted in nearly a $400 bln increase in private investment. So the stimulus DID NOT CROWD OUT PRIVATE INVESTMENT! Oh, but perhaps we mustn't blame Republicans completely. After all, they still have yet to enact their "cut and grow" policies. I can't wait to see how investment and the economy boom after that. --"The cabinet decided to proceed immediately with the sale of stakes in OTE, the Postbank, the Athens and Thessaloniki ports and the Thessaloniki water company in order to front-load its ambitious privatisation programme," said Greek Finance Minister George Papaconstantinou. Give an inch and the neoliberals will take a mile! A must see video mocking those wonderful libertarian plutocrats, the Koch brothers. Don't let your next vacation be ruined by "Big Government." Come to Somalia...Libertarian paradise! Can we send all the Libertarians here, please! "The explosive growth of student loan debt is troubling for a variety of obvious and not so obvious reasons. More needed attention is being drawn to higher education and questions are being sharply directed at the way college education is financed. The bubble in higher education has similar parallels to the bubble experienced in housing. Owning a home is a good thing and has been part of our national identity for close to a century. Yet during the mania very few questioned the method of financing this otherwise solid financial investment. It all depends on how you finance the purchase. The same dilemma is occurring with pursuing a college degree. Very few will argue that going to college is a bad idea. Knowledge is power as we all know. Yet is it necessary to go to a school just because they added a $10 million Olympic sized pool? The additional bells and whistles are similar to the peak bubble days in California where sellers tried to convince buyers that the new whirlpool and granite counter tops added tens of thousands of dollars in value. Value by what standard? Most of the mania was fueled by easy access to debt greased by Wall Street and backed by the government. The fact that we are approaching $1 trillion in student loan debt is staggering...."
" 'Every person should have a college degree' which rings eerily similar to 'every person should own a home.' At what cost? The only reason this is happening is because of Wall Street and government backed loans. Thanks to this new model, the for-profits are operating in the new world of subprime colleges. Yet there is no walking away from student loan debt which puts an albatross on an entire generation of college students. Will these people even be able to purchase a home in the future? Will their degree actually increase their earnings potential?" Read the whole thing at Subprime colleges – Student loan debt now equivalent to 7 percent of U.S. GDP. For-profits claim Harvard bragging rights and that barbers can make $150,000 to $250,000 a year to lure students. Debt ceiling is unconstitutional. Geithner, members of Congress, should be sued! The debt ceiling constrains the ability of the Federal Government to pay its debts even though the Constitution mandates that it do so. Treasury Secretary Geithner has already stopped paying gov’t pensions in direct violation of the 14th Amendment and he may soon be forced to stop paying Social Security. He should be sued along with members of Congress who are using this statute—the debt ceiling—to trump the Constitution. In the case of a statute versus the Constitution, the Constitution wins! There is a strong legal case to be made here and the Supreme Court has already upheld Section 4 in a prior case. Any lawyers willing to take this up on a "pro bono" basis? Prof. Galbraith mentions economics at UMKC. h/t Rober Vinneau of Thoughts On Economics, who asks, "Is there any other discipline in which members treated as on the fringe have so many with such credentials?" UPDATE: Doug Smith, Shock Therapy for Economics, Part I is a must read. In fact, I rate it an all-time great. Even mentions "modern monetary theory." As of today's Treasury Statement (May 16 statement date) here is the breakdown on the total debt limit and total debt outstanding. As you can see, the total public debt outstanding is $14.345 trillion. That's approximately $52 bln over the limit. This shows the debt ceiling is meaningless. It also shows that the government can keep on spending and issuing debt and if it does, the Republicans lose all the leverage that they think they have on spending cuts and debt reduction. The question is, does Obama and Geithner know this? Help economics and yourself: become a WEA member for free. Heard this idiotic, ignorant, misinformed, comment from CNBC anchor David Faber (a.k.a "The Brain") earlier today. How is it possible for the public to have any chance at understanding our economic realities when we constantly are exposed to the endless barrage of misinformation and ignorance that comes out of the media? In Commodities and Paradigms Shifts, Rick Bookstaber disagrees with Jeremy Grantham that increasing global demand for commodities is forcing a paradigm shift. He agrees that a paradigm shift is underway, but according to Bookstaber, it is in the opposite direction, as digital cocooning results in more consumption of digital content and less consumption of physical resources. In Looking in the Rearview Mirror, Phil Hart thinks that looking ahead by looking back may no longer work so well. Predicting the future has not gotten any easier. Here at The Oil Drum, we picked up early on one of the great themes of the 21st century. Others denied the evidence until well after it was staring them in the face. But it is much harder to see where things go from here. The second half of the 20th century was defined by remarkable growth in oil consumption, population, credit and debt, and all manner of other things. Neo-liberal economists have become accustomed to getting out their rulers to make predictions of the future and holding all spell-bound with their macro-economic prescriptions. I think those days of extrapolating the past as a useful guide to the future are over, and the sooner we develop a new economic paradigm the better. The future is likely to be one of discontinuities and sharp transitions and our rudimentary models and bureaucratic systems will not be up to the job. If deleveraging of the record amounts of debt in every corner of the global economy is not already enough to start a downward spiral (still unexpected by the mainstream), then a ceiling on oil supply and the inevitable price response to force declines primarily in OECD countries will trip us up anyway. That forced transition to declining consumption for OECD countries could feel pretty painful rather soon, even before global oil supply decline sets in. The good news is that resource decline rates look lower than feared a few years ago, and the plateau may continue (certainly not to 2030 though!). In an engineering sense, we may be able to adapt at the pace required, but whether we can adapt our economies and credit money system in particular is a different question. Looking ahead, the only thing I can say with any confidence is that the years and even decades to come are likely to be characterised by much greater volatility than we are accustomed to. It could be a very bumpy ride. Read the whole article at the Oil Drum here. Can the world handle the addition of an army of Far East consumers? Will their consumption patterns mirror that of the U.S.? What will this mean for the standard of living for the rest of the world? To be sure, U.S. politicians and talking heads will not worry about the aforementioned concerns. Instead, we will be bombarded by talk of "unsustainable debt" and the glory of the "free market". Eclipsing a terrible milestone as home prices fall harder than the 1928 through 1933 Great Depression Collapse: Lessons from the Great Depression Part 32. Housing prices continue to fall as other costs eat up disposable income. ...Since the start of 2005 to the end of 2010, three million seven-hundred thousand American families have been kicked out onto the street. At an average of 2.3 people per household that’s 8.5 million Americans who have been directly, physically, affected by the popping of the US Housing Bubble, so far. Last week, cable TV show "Dirty Jobs" host Mike Rowe testified before Congress on what he sees as a critical shortage of certain types of skilled workers in the U.S.
News link here. Testimony here (short read). Right now, American manufacturing is struggling to fill 200,000 vacant positions. There are 450,000 openings in trades, transportation and utilities. The point that Rowe makes in regard to perhaps there are some job openings that are going unfilled in certain geographic areas of the US may be true but let's apply some perspective. According to the Labor Department there are currently 13.7 million unemployed persons in the US, and another 8.6 million that are involuntary part-time workers. Last month, the US economy added 244,000 non-farm jobs so the 450,000 openings that Mike Rowe talks about in his testimony, seems like about 6 weeks of normal hiring in the current crappy US economy. Allowing 6-8 weeks to establish, identify candidates, interview and then make the hiring decision seems simply reflective of the current environment and perhaps not out of the ordinary. The jobs that Rowe testified about will perhaps just be filled as normal in 6-8 weeks. Mike Rowe may well be identifying about 500,000 jobs that are due to be filled in about 2 months, but what about the people that comprise the 434,000 new filings for unemployment in the latest report for last week? And what about the over 1.5 million new college graduates seeking employment after graduating this month? I'm afraid that while Mike Rowe may be well meaning, his type of testimony here may just reinforce already held dogmas by policymakers that the US government's macro-economic policy can never be one that would result in true full employment. It would be easy for these types of policymakers to just blame the whole thing on some sort of 'skills mis-match' after listening to Rowe. Or perhaps they will jump over to condemnation and blaming the US education system for failing in it's mission. If the US truly wants full employment, the Federal government can use fiscal policy to facilitate this type of economy at will. Congress needs to hear testimony from any/all of the MMT thought leaders on the topic of a Federal Job Guaranty Program. You can't make this stuff up. Story at VOA here. "Police say when they arrived at the hotel, Strauss-Kahn had already left for the airport, leaving behind his mobile phone and other personal items." Looks like the IMF is going to get former J P Morgan and current IMF official John Lipsky to take over. Many people have been arguing that the RMB has been appreciating againt the dollar and that rebalancing has begun. Michael Pettis says, in nominal terms, yes, but in real terms, not so much. Moreover, not only currency appreciation is involved in the rebalancing equation. There are also real versus nominal interest rates and wage growth, as well as productivity. There are some interesting implications of this constellation of adjustment processes that are worth examining. To summarize, there are three important causes of the consumption imbalances that are plaguing long-term growth prospects in the Chinese economy. One of these, the undervalued exchange rate, hasn’t changed much in the past year and so has not contributed to rebalancing. The second, excessively low [real] interest rates, has gotten significantly worse in the past year and so has exacerbated the imbalances. The third, lagging wage growth, has gotten much better and so has contributed to Chinese rebalancing. What is the net effect of the three processed? Unfortunately there is no real way of comparing the impact of each variable, and so there is no real way of judging the net effect. All we can do is look at household consumption and its relationship to GDP growth, and infer the net impact from that. Read his entire analysis at China Financial Markets, Rebalancing through Wage Increases. This is an excellent summary of what is likely happening in China now, in spite of what you may be hearing. Tea Party godfather and Austrian School advocate Ron Paul put his foot in his mouth and let his inner neoconfederate slip out during a recent episode of the Chris Mathews Show. Physician Paul revealed that he would not have voted for the 1964 Civil Rights Act. Watch Ron Paul's blunder here. How does the Austrian School think it can ever go mainstream when it's most prominent advocate reveals himself to be a defender of oppressing his fellow man? "One of the most dangerous ideas at large in the current culture is that the "free market" is the ultimate arbiter of political decisions, and that there is an "invisible hand" that will direct us to the most desirable future provided the free market is allowed to actualize itself. This mystical faith is based on some reasonable empirical foundations, but when embraced as a final solution to the ills of humankind, it risks destroying both the material resources, and the cultural achievements that our species has so painstakingly developed". 2006:What is Your Dangerous Idea? The Free Market. "Often Aetherists (theorists who rely on an Aether variable) think that their use of the Aether concept renders the theory untestable. This belief is often justified during their lifetimes, but then along comes clever empiricists such as Michelson and Morley and last year's tautology become this year's example of a wrong theory. "Aether variables are extremely common in my own field of economics...."
Matthew Yglesias says he prefers "phlogiston". Athens — Already struggling to avoid a debt default that could seal Greece’s fate as a financial pariah, this Mediterranean nation is also scrambling to contain another threat — a breakdown in the rule of law. Thousands have joined an “I Won’t Pay” movement, refusing to cover highway tolls, bus fares, even fees at public hospitals. To block a landfill project, an entire town south of Athens has risen up against the government, burning earth-moving equipment and destroying part of a main access road. Fellow contributor here, Prof. John T. Harvey, explains inflation at his Forbes blog in terms of MV=Py. By analyzing the meaning of the symbols, he shows how mistakes were made about their implications and also how to correct these mistakes. We are over the debt limit! And we didn't "run out of money" and the world didn't end. However, what is important is the political response to this, which will be to bring it back down via spending cuts. That will hurt aggregate demand and the economy. Winterspeak agrees with Paul Krugman's column, The Unwisdom of Elites, and then explains why Krugman is one of the economic and academic elite responsible in the first place. As usual Winterspeak sums it up in his characteristically pithy way within the MMT paradigm. Hint: It's in the sectoral balances, and the economic elite doesn't get this because they don't understand accounting. "I suspect you're one of those MMTers"
I was responding to an article she wrote entitled, "Rear-View Mirror Can’t Forecast 2011 Economy." In the article she attempts to argue that the 1.8% Q1 GDP growth was an aberration. According to her, one of the reasons why we should be getting ready for boom times is because (sigh), finally that darned, growth killing fiscal stimulus will soon end. "Finally there are the waning effects of “fiscal stimulus,” or government spending by another name. Since one dollar can’t be spent by two entities at the same time, government spending can only substitute for private spending. Any resulting increase in GDP is temporary." So, being the masochist that I am, I decided to send Ms. Baum an email and ask her to clarify. Me: "How does the “non-government” get the dollars to satisfy their tax liabilities or, to “net save” in that unit of account?" C. Baum : "I DON'T UNDERSTAND THE QUESTION BUT I SUSPECT YOU ARE ONE OF THOSE MMTERS." Me: LOL!!! YOU RESPOND TO MY QUESTION WITH A SNARKY REMARK. OKAY. SO, THE QUESTION SEEMS TO BE PRETTY SIMPLE. HOW DOES THE NON SOVEREIGN, I.E., THE PRIVATE SECTOR GET THE DOLLARS TO SATISFY THEIR TAX LIABILITIES? WHERE DO THEY GET THOSE FROM? IT HAS TO COME FROM SOMEWHERE? YOU SAY THE GOVERNMENT AND THE PEOPLE CANNOT SPEND THE "SAME DOLLAR." WHAT IN THE WORLD DOES THAT MEAN? DOES THE GOV'T HAVE TO GET BACK THE DOLLARS IT ISSUES IN ORDER TO BE ABLE TO SPEND? IS THAT WHAT YOU ARE SAYING? C. Baum: I'M TALKING ABOUT BASTIAT'S BROKEN WINDOW. ACTUALLY AFTER BEING ATTACKED BY MOSLER FOR A SPELL, I FINALLY UNDERSTAND AFTER READING ROBERT MURPHY ON MISES YESTERDAY WHAT MMT IS ALL ABOUT. NOW IT REALLY MAKES NO SENSE. I DON'T NEED THE GOVT TO SPEND SO I CAN SAVE. THAT'S LUDICROUS. I CAN'T IMAGINE ANY SMART PERSON CAN THINK THAT. MAYBE YOU CAN ANSWER A QUESTION: WHY IS IT CALLED MMT SINCE IT'S ABOUT FISCAL POLICY. MURPHY'S PIECE MAY WELL DESCRIBE AN ECONOMY OF PRIVATE ACTORS WHERE THERE IS NOT AN AUTHORITY THAT IMPOSES A TAX THAT CAN ONLY BE PAID IN UNITS OF ITS OWN CURRENCY. IF A WORLD LIKE THAT EXISTS, PLEASE LET EVERYONE KNOW IN A NEW COLUMN. I CERTAINLY AM NOT AWARE OF ONE. I BELIEVE THE TERM MMT CAME ABOUT FROM A BLOG POST BY SOMEONE BACK IN THE 1990S AND IT WAS NOT AN MMTER. (DON'T QUOTE ME.) HOWEVER IT CAME ABOUT, THE NAME STUCK. C. Baum: MOSLER USED TO SEND ME NOTES AND SEND TO HIS ENTIRE DISTRIBUTION, SO THEN I HEARD FROM THEM. WHAT IS HIS MOTTO? THERE IS NO PROBLEM THAT CAN'T BE FIXED BY MORE GOVERNMENT SPENDING? C'MON. Me: NO, THAT IS CERTAINLY NOT HIS MOTTO. YOUR STATEMENT SHOWS THAT YOU HAVE NOT EVEN TAKEN THE TIME TO INVESTIGATE MMT. YOU CRITICIZE IT WITHOUT EVEN UNDERSTANDING IT. C. Baum: B/C THERE IS NOTHING TO UNDERSTAND BUT SOME ACCOUNTING TAUTOLOGY. I DID LOOK AT IT AT THE TIME. SO PLEASE DON'T ACCUSE ME. MOSLER'S LAW: THERE IS NO FINANCIAL CRISIS SO DEEP THAT A SUFFICIENTLY LARGE TAX CUT OR SPENDING INCREASE CANNOT DEAL WITH IT. YOU SAID THAT MOSLER STATES, "THERE IS NO PROBLEM THAT CAN'T BE FIXED BY GOVERNMENT SPENDING." YET WHAT HE SAID (FROM THE ACTUAL QUOTE FROM HIS WEBSITE, WHICH YOU INCLUDED IN YOUR EMAIL TO ME) IS, "THERE IS NO FINANCIAL CRISIS SO DEEP THAT A SUFFICIENTLY LARGE TAX CUT OR SPENDING INCREASE CANNOT DEAL WITH." ANYWAY, NICE CHATTING WITH YOU. GOOD BYE. Oh yes, the "elites" are getting nervous now. We have entered their domain and one by one they are getting picked off. They've already lost Goldman, Morgan Stanley and the other smart ones among their ranks will soon become converts, too! Baum will certainly be among the last to turn, if ever. "With Chinese wages rising at about 17 percent per year and the value of the yuan continuing to increase, the gap between U.S. and Chinese wages is narrowing rapidly. Meanwhile, flexible work rules and a host of government incentives are making many states—including Mississippi, South Carolina, and Alabama—increasingly competitive as low-cost bases for supplying the U.S. market. "After adjustments are made to account for American workers’ relatively higher productivity, wage rates in Chinese cities such as Shanghai and Tianjin are expected to be about only 30 percent cheaper than rates in low-cost U.S. states. And since wage rates account for 20 to 30 percent of a product’s total cost, manufacturing in China will be only 10 to 15 percent cheaper than in the U.S.—even before inventory and shipping costs are considered. After those costs are factored in, the total cost advantage will drop to single digits or be erased entirely, Sirkin said." The great leveling is proceeding apace as the emerging world rises and the developed world sinks to meet it. Two blog posts brought MMT further to the fore in the blogosphere today. John Quiggen posted Some propositions for chartalists at Crooked Timber. Robert Murphy posted The Upside-Down World of MMT at Mises. A good exchange was had by all at Matt Rognlie's over his post, The fallacies of MMT. Some gems in the comments. Sell on News develops the idea of money as rules to include "meta-money," the result of financial innovation such as derivates. That is the world we are now in. It is why such huge distortions are appearing in areas like quantitative easing, extremely low interest rates, an ailing cost of capital, the hankering after something solid in precious metals like gold and silver, equity markets whose pricing seems strange. Governments have given up oversight of the financial markets, handing it over to the traders. We must now suffer the consequences as the traders try to outdo each other in an infinite game of pass the parcel. Or, more accurately, taking out bets on who will pass the parcel to whom. Eventually, I suspect, GFC version 2 will come along, and the rules will finally collapse. Governments will have to come in and re-set them. There will be a huge re-regulation backlash. But how is it that governments allowed it to get to this stage? What ever happened to governing? I agree with the notion that money is rules. Money is not a thing or a set of things, it is essentially an idea. This idea is one of the greatest intangible inventions of humankind, like markets. Money and markets go together like horse and carriage or ox and plow. Once there was a domesticated horse, it was a simple step to the carriage. Same goes for ox and plow. But horses, oxen, carriages and plows are real things. Money and markets are not. Automobiles are horseless carriages, and tractors are ox-less plows. No great imaginative jump. But money and markets have evolved in ways that could never be imagined or anticipated, and only on the basis of transforming rules. Money and markets just took a fiant step as ideas and the global financial crisis was the result of an failure to harness those ideas sufficiently. The question is now that the genie is out of the bottle, whether it can be controlled. The Prospect talks with James Galbraith about why the doomsday predictions on the debt ceiling are wrong. Prof. Galbraith explains why the debt-ceiling debate is much ado about nothing and the President should not let the deficit hawks hold him hostage. Short and sweet. Steve Keen debunks Paul Krugman's attempt to model Minsky using mainstream modeling. Though I applaud Paul Krugman for being probably the first neoclassical economist to attempt to model Minsky after decades of ignoring him, the model he is using embodies everything that is bad in neoclassical economics. • Marshal Auerback, Roosevelt Institute: "Ireland and the EMU: Bailout or ransom demand?" • Dr, Stephanie Kelton, University of Missouri – Kansas City: "A Fix for the Euro Bug: Modern Money Theory, Sovereignty and Fiscal policy"
• Prof. Randall Wray, University of Missouri – Kansas City: "Real Future Security: Modern Money Theory and Deficits, Pensions, Bonds"
• Prof. Randall Wray: "A Jobs-Based Monetary Policy for the Eurozone"
See also L. Randall Wray, Should Irish Voters Follow the Example Set by Icelandic Voters? Did Oil Peak in 2006? Already, rising energy costs are taking their toll around the world, with U.S. economic growth stumbling and raising the spectre of stagflation, as well as, helping to drive up food prices in Latin America, and driving inflation in Europe. Why are There Legal Limits on US Bond Purchases? If the US Government is so concerned about being able to supposedly "borrow money" through the process of selling US Treasury securities, then why would the government limit purchases of these securities in any way? $5,000 in I Series Bonds." They changed a law in 2008 that lowered the limit you can purchase of US Savings Bonds to just $5K PER YEAR? Huh? What is going on here? Regular marketable US Treasury securities also have a limit, but it is $5M per auction. This is certainly a lot for an individual, but for a non-financial corporation that is sitting on 100s of millions if not $billions of retained earnings, this could create a problem. How could you think you have a "funding problem" and then at the same time implement these ridiculously small purchase limits for bond buyers? Corporate welfare for the banks and Primary Dealers? What else could it be? "Why would someone want to steal 30 concrete parking stops that each weigh 250 pounds? The bizarre theft has a Kansas City, Kan., business manager and police confused." The news anchor asks: "So much work for so little payoff?" No one here is probably confused by this phenomenon: Stealing concrete. The current price ratio between labor and commodities is so perverted, that desperate contractors see a value proposition in stealing precast concrete items off of a parking lot. Back in 2008 here in Maryland, aluminum prices were so high due to the rampant out of control commodity speculation, that thieves were cutting down spun aluminum street-light poles and turning them in for scrap, falling them like trees and cutting them up into "logs"; they were also stealing the empty beer barrels from the rear of bars and restaurants. The state government of Maryland had to enact new legislation to regulate the activities of the scrap yards as a result. If we had a government that was providing enough NFA to the non-government sector to satiate both domestic and external USD savings desires, and enough to also provide the correct amount of settlement balances to facilitate consumption desires, and throw in some appropriate level of commodity markets regulation, none of this would be happening. UPDATE MEMO TO CONGRESS: When you see people stealing concrete off the ground you have a REEEEEAAALLLYYY SCREWED UP economy. Even if the government pays a very low nominal rate of interest of reserves, this doesn't mean that the real costs are any lower. Economists almost universally agree that the real interest rate, in the long term, is pinned down by real factors like investors' preferences for intertemporal substitution and opportunities for capital investment. If you disagree with this, and you have some competing theory by which the Fed can change the long-term real interest rate through purely nominal manipulations, then I'm happy to hear your case. Otherwise, a decrease in the nominal interest rate (enacted via a decrease in interest paid on reserves) will simply manifest itself as a decline in the long-term rate of inflation, with no fiscal benefits whatsoever. Did the "Bond King" just go short at the bottom? Could the debt ceiling issue destroy gold? We may have already "run out of money"
What is a 'Government Liability'?